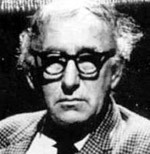 Patrick Kavanagh was born at Mucker, Inniskeen, Co. Monaghan in 1904, where his father was a small farmer and cobbler. He left school at thirteen to plough 'The Stoney Grey Soil of Monaghan' and also sit alongside his father at the cobbler's bench. Thought a fool by the villagers for his belief that he would become a great poet, and scorned by the local farming community as a bad farmer, Kavanagh left to pursue his poetical leanings in Dublin. Befriended by A. E. (George Russell), he soon began to establish a reputation for himself around Dublin's literary pubs, not only for his writing abilities, but also for his conceit, his rudeness, his colourful language, his caustic tongue and his drinking habits. The breakthrough he had hoped for came in 1936 with the publication in London of the autobiographical 'Tarry Flynn'. Patrick Kavanagh died in Dublin on 30th November 1967, bringing to a close the life of one of Ireland's most controversial and colourful literary figures. It is somehow ironic that while his lifestyle and poetry are virtually the alter image of Yeats, both men are today widely regarded as the most influential of Ireland's twentieth century poets.